A laborer working at a job site was struck by a large form connected to a crane in windy conditions, which resulted in paraplegia. On behalf of the worker and his family, claims were brought against the employer on basis that its actions and/or inactions were substantially certain to result in serious injury or death. Thirty-one year old Spanish speaking worker fell approximately 20 feet from a scaffold and sustained multiple injuries. Successful in obtaining Court award of Permanent Total Disability Benefits (lifetime benefit) for this young, injured worker. Fifty-six year old Spanish speaking laborer fell and injured his back and head. 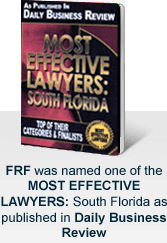 Based on the opinions of treating physical doctor as to prescribed medications, secured Court award of Permanent Total Disability Benefits for the injured worker at the maximum Florida compensation rate. Case settle for present value of future benefits.